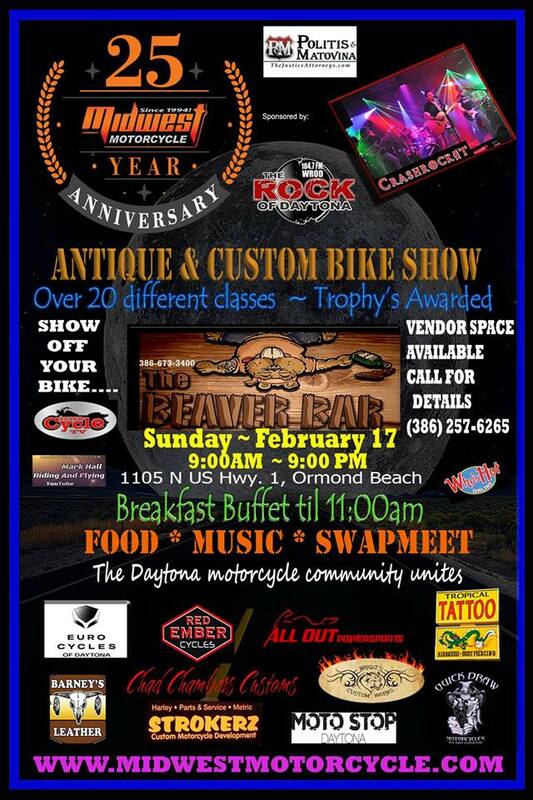 Midwest Motorcycle wants to invite everyone to our 25th Anniversary Event at the Beaver Bar in Ormond Beach, FL on Feb. 17th from 9:00am until 9:00pm. Please join us for this Special 25th Anniversary Celebration for Midwest Motorcycle of Daytona. We have thoroughly enjoyed serving the community for the last 25 years. Many of our neighboring "motorcycle related" businesses and friends will be joining us. We will host our "FREE" annual professionally judged Bike Show and Great Entertainment by your favorite and ours " Crash Rocket"
Antique & Custom Bike Show registration is FREE and begins at 9:00am until we run out of room.....so register early because we fill up fast. Judging will start around 2:00pm and Trophys will be awarded between 3 and 4 pm. Come hang out with us and the other businesses that will be on display for the event! Enter the Bike Show! Have a blast! LET THE PARTY BEGIN! !